Diss Guy Miss Guy, Vol. 78 | The Diss. ← Your Annotated Smartphone Bathroom Reader for Thursday, June 12th, 2014. Every Wednesday night I drive up north of Seattle to Edmonds where I play three-on-three with the same group of below average athletes with minimal basketball training. And every week there’s a blend of truly horrific basketball like blown layups and deep threes that draw no iron, no backboard and float out of bounds – the ugliest of airballs. Mixed in with the ugly is the occasional beauty of organic ball movement that leaves the heads of defenders spinning helplessly in collective confusion trying to find someone to guard only to realize that your man (Is it your man or did you switch? Do we know?) is too far for you to possibly affect his shot which is already out of his hands by the time you realize what’s happened, inevitably falling through the net and ensuring more defense for you because of course we’re playing make it take it. In my game, it’s a completely un-choreographed, partially accidental flow of events, but for the San Antonio Spurs it’s a synchronized machine as reliable as a Swiss timepiece, a calling card of perfect floor spacing, stretching the defense to tearing points which Spur shooters masterfully exploit. 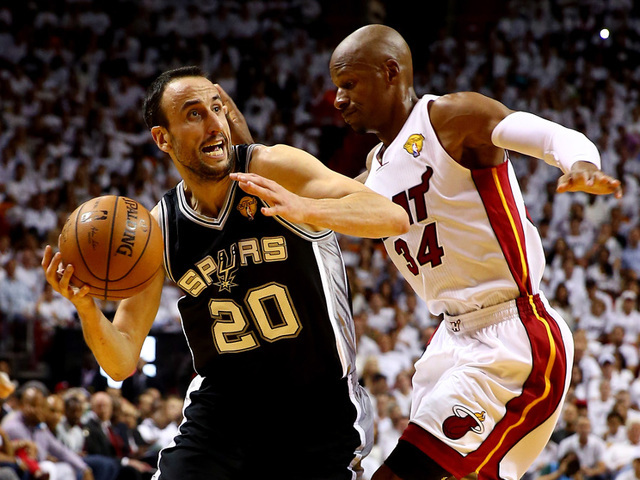 Is it possible that the Spurs have trademarked something as fundamental as ball movement? Watching games three and four of these NBA Finals, I’ve repeatedly seen Heat defenders with that same look of being out of position, too slow to respond, and ultimately deflated by another wide open Spurs look. And this is a Heat team with intelligent and athletic defenders drilled in the fine arts of defensive rotation and switching, not a few guys over 30 trying to burn empty calories in Edmonds. If Brazilian football is marked by its jogo bonito, its beautiful, idiosyncratic style of play, the stable, ever-evolving Spurs offer basketball fans a beautiful version of the NBA game. As our mainstream in-game navigators and supposed tastemakers, the announcing team of Mike Breen, Mark Jackson, and Jeff Van Gundy, repeatedly remind us that this is something to aspire towards, that kids and youth coaches should be watching not just how the Spurs play the game, but how they conduct themselves. The Spurs have become the actualization of a whole school of idealized thought about what basketball should be and as someone who regularly plays, I can attest to the unspoken joy brought when, without a word whispered or a promise made, your teammate sets a pick on your man, reads the defense’s reaction, rolls to the hoop at the exact moment he needs to, and knowingly, with feeling, you make a leading pass that he catches in stride for an easy layup and afterward you nod in agreement that you’re on the same plane, each person reading the other. It’s not just that this motion, this joint activity is effective, but it’s fun. Sharing, collaborating with instantaneous results is an uplifting feeling. On the flip side, I’ve played alongside players whose talent outshines everyone else on the court, who are suns with dim bodies circling in their orbit. We can win, go on a long run at an open gym, and the talented center of our pickup universe will score 80% of our points with a usage rate that would make Allen Iverson blush. For 80% of the team, this isn’t a fun prospect. It’s boring exercise in the least inclusive fashion. It is the antithesis of the Spurs’ brand of jogo bonito where selfishness vacuums up all the fun with every shot this guy hoists up. We’re repeatedly told of the glorious selflessness of the Spurs. The gushing tastemakers I referenced above remind us of San Antonio’s greatness to the point that the idea becomes saturated. There is no empty space in which to process the dominance and enjoy it on your own terms, rather the discomfort of not telling the audience what they’re seeing or feeling is incomprehensible. Last night as I watched the Spurs decimate and demoralize an outmatched, outworked Heat team, I had finally had enough and clicked the mute button to shut down the talking heads who, in their haste to anoint, instead distracted from San Antonio’s dominant performance with their incessant force feeding of what is right, what we must like, what we should teach our children, and on and on. As a fan grown weary, not from Spurs success, but from being reminded of how great and selfless and idealized the Spurs are, every game and series these Spurs lose is another victory in a battle against invisible, intangible foes and ideals. Victories over San Antonio affirm that there are alternatives to the “right way” to play the game which furthers the likelihood that there is no right way to play the game except the way that wins. If that’s Kobe Bryant attempting 37 shots or the Spurs going 10-deep to wear out a thin Miami team, so be it. Besides, I’d be telling lies if I said I always make the right pass and take the open shot in my weekly games. Sometimes I over-dribble and shoot spinning fadeaways and even worse: sometimes they go in. Maybe it’s tapping into my own self-interest or maybe it’s me just trying to prove something to someone who doesn’t exist and even if they did, they wouldn’t care. This entry was posted in Diss Guy Miss Guy. Bookmark the permalink.